If there was ever a place that could have been made for pet friendly holidays, then it’s got to be Devon. With the kind of beaches that’ll have your dog thinking he’s in canine Heaven, to a landscape that makes walkies an adventure again, Devon’s perfect for that break with your pet. One day you can be watching your pet play catch with the waves, and the next, wandering ancient walkways…and here are just a few pointers to get you planning. Devon’s famous for its sandy beaches, so it’s only fair that some of the best ones welcome paws as well as feet on their sands. Saunton Sands, on the north coast, is one of the county’s best-loved beaches, and if you turn left at the end of the slipway, you’re free to enjoy it with your pet all year round. And, if you think it looks familiar, it’s because the beach was the setting for the video for the Robbie Williams classic – ‘Angels’. 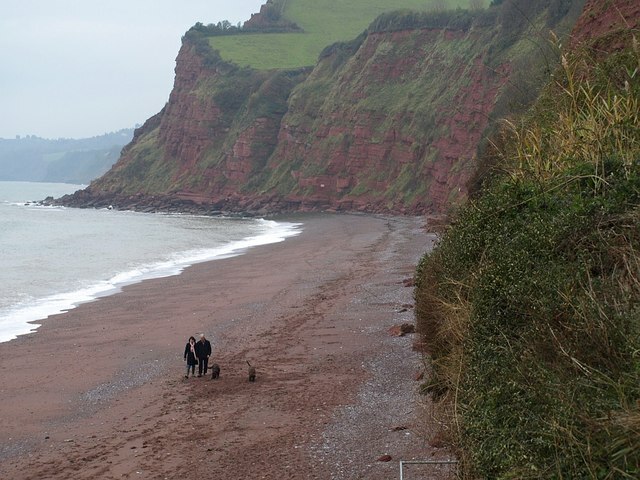 Down on the South Coast, near Shaldon, Ness Cove Beach is another of our faves, and the fact that you access it via a smugglers’ tunnel only adds to the fun. This shingle beach isn’t huge, but it’s off the beaten track enough that you’ll feel as though you’ve stumbled on a secret. The South West Coast Path covers 630 miles, and Devon’s home to some of its most spectacular stretches. Dogs are welcome to wander the path too, and when it crosses beaches with seasonal dog bans, pets are allowed to cross the beach to pick up the path. The coast path makes for some of the most memorable pet friendly Devon walks, and you’ll find it dotted with cafes and pubs that welcome pets too. The best way to plan your walks is to check out the closest stretch of the path to your dog friendly cottage, and then start planning how far you want to go. The fabulous thing about Devon is that they’re as doggy mad as we are, and that means plenty of choice when it comes to those pet friendly places to eat (and drink). If you like good food, you’ll find some seriously foodie pubs that welcome dogs along too. 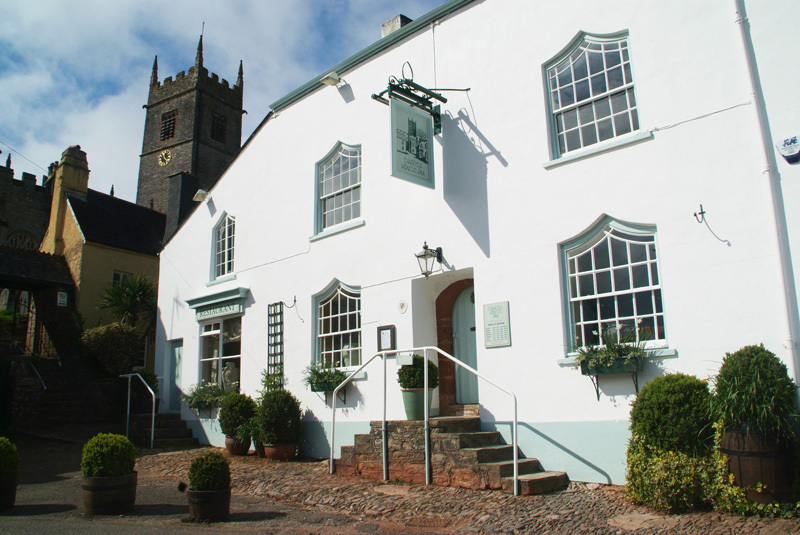 The Church House Inn at Marldon in South Devon, remains one of the county’s best-loved pubs. Featured in The Good Pub Guide, and with award after award to its name, this delightfully olde worlde pub welcomes doggies in the bar area, and on sunny days you can sit outside and enjoy the village setting over a pint of Real Ale. Devon’s pretty much one big dog friendly playground, so it’s a good idea to plan your doggy days out before you start your holiday. Dartmoor National Park’s perfect for spending time with your pooch, as its landscape’s criss-crossed with pathways, ancient landmarks and natural sights, just make sure you keep your dog close to you when there’s livestock nearby. The Dartmouth Steam Railway and Riverboat Company’s one of the best ways to explore South Devon, and dogs are welcome aboard to enjoy the experience too. 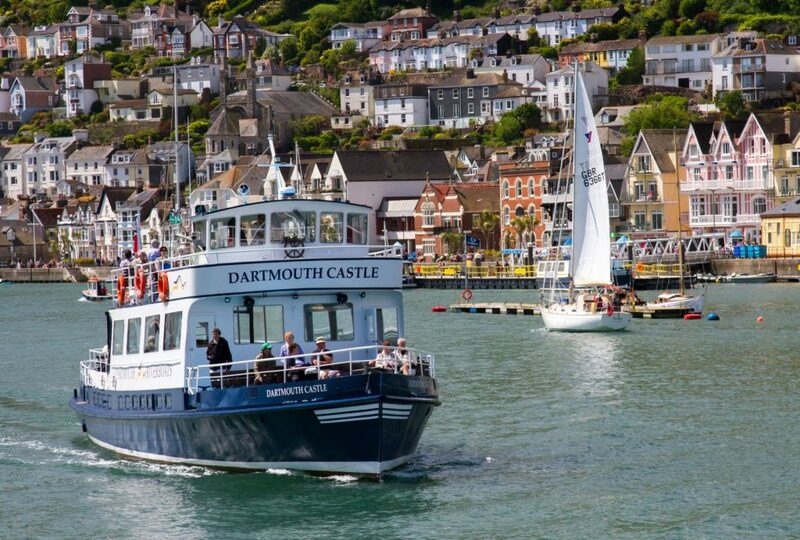 To be honest, this is one of the most unique pet friendly days out in Devon we can think of, and you’ll be free to chug your way through the countryside from Paignton to Kingswear, where you can pick up the ferry across the river Dart to historic Dartmouth.